I have been admiring Swoon quilts since the pattern first came out. This summer I decided to get my feet wet by slicing up some prints from Tula Pink's Salt Water line. I cut and assembled each block over the last two months as I was able to carve out a bit of time in the odd weekend here and there. 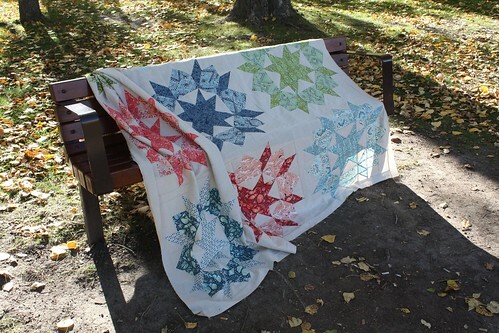 My previous posts on this Swoon quilt give more detailed pictures of each of the blocks. Last weekend I managed to polish off the sashing so my hubby helped me to take some pictures in a beautiful fall coloured park. 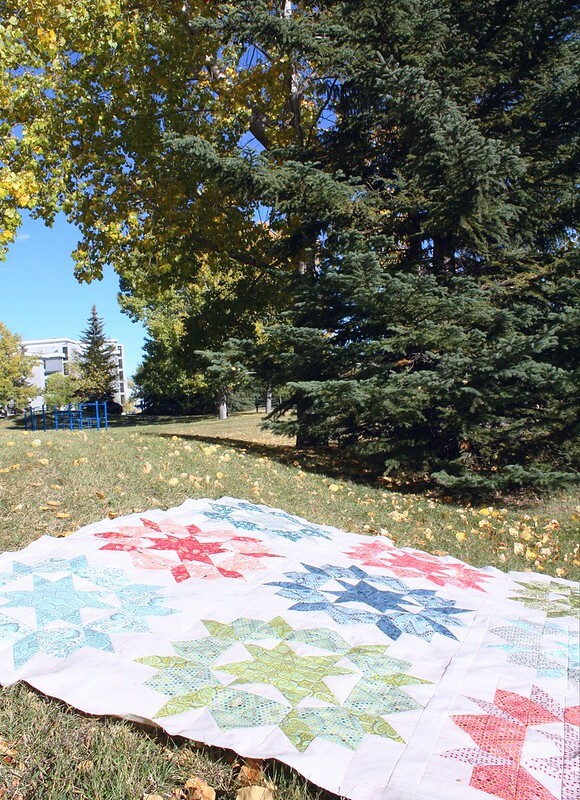 I'm on a tight deadline to finish up this quilt so I was thrilled we had such a beautiful day for photos before putting this project in the mail. This massive queen sized quilt top is on its way to a long armer and I'm seriously excited to see how it turns out in a few weeks. I think the stars aligned just perfectly as I met a very talented long armer just as I was fretting about how to finish this up in time. This will mark the first quilt that I've sent off to be quilted rather than doing it myself and I'm looking forward to seeing her take on how it should be quilted. In a few short weeks I'll find out! It's beautiful. Can't wait to see it once you get it back! 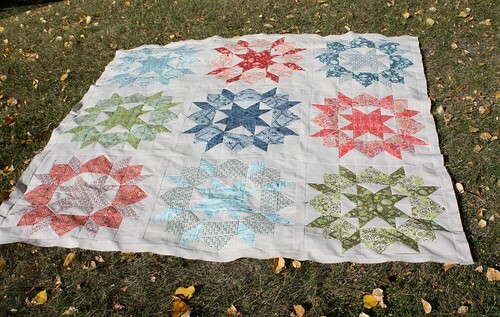 The Salt Water fabric makes a very beautiful Swoon quilt. Good job Kelsey! Congratulations with this beautiful Friday Finish! Ooh love it when the stars align ;) Did you talk about the quilting plan or are you just going to see what she comes up with? Looks fantastic Kelsey! Can't wait to see it quilted up! Fabulous! How did you decide to quilt it? Or are you asking the quilter to take some liberty? Or, do I get to wait until the finish/final review? Kelsey, this is soooo gorgeous. Like really, REALLY beautiful. A wow quilt - I love those kind. I imagine it will only be more gorgeous when it comes back from the long-arm. Cannot wait to see!!! It turned out beautifully! Two of my favorites, Swoon and Salt Water! It looks beautiful, I love the contrasts in the blocks. Can't wait to see it all quilted! So pretty! Can't wait to see it quilted! Exciting! It's so good when you find a long-armer you're on the same page as. Also such a relief not to have to quilt those giant quilts yourself. 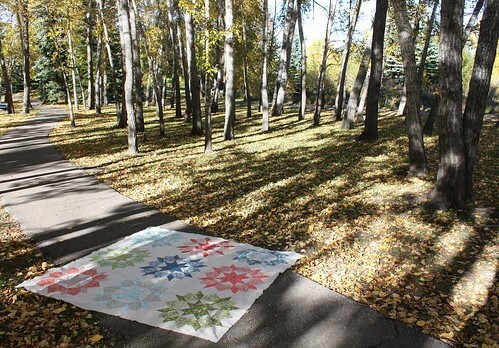 This is really beautiful - can't wait to see it quilted.